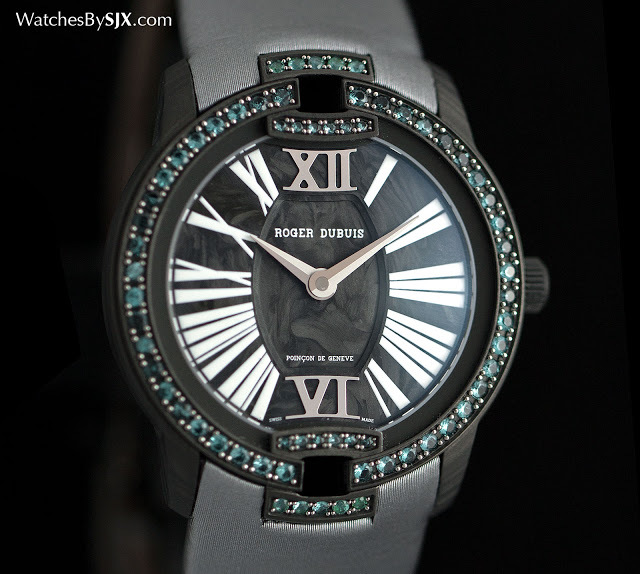 Ladies’ watches made up almost the entire line-up unveiled by Roger Dubuis at SIHH 2016, with the Velvet wristwatch presented in a diverse range of styles. Here’s all you need to know about its new watches, complete with original photography and prices. 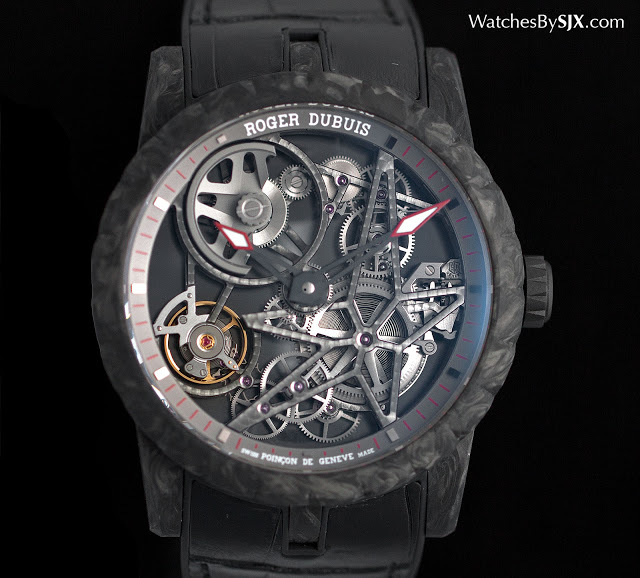 For a brand best known for its oversized men’s watches with tourbillons, Roger Dubuis‘ about-face to focus on ladies’ timepieces at SIHH 2016 is significant, perhaps implying there are limits to the market for high-end men’s watches. 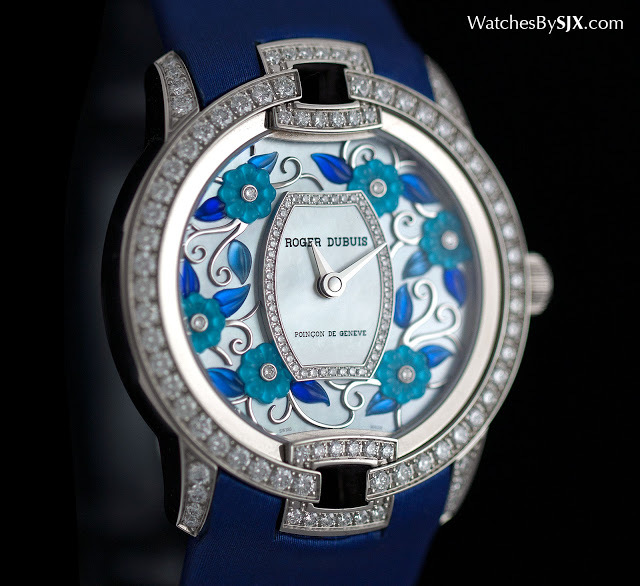 All of the ladies’ watches introduced this year are surprisingly diverse variants of the Velvet, ranging from one in carbon composite to others decorated in enamelled blossoms. 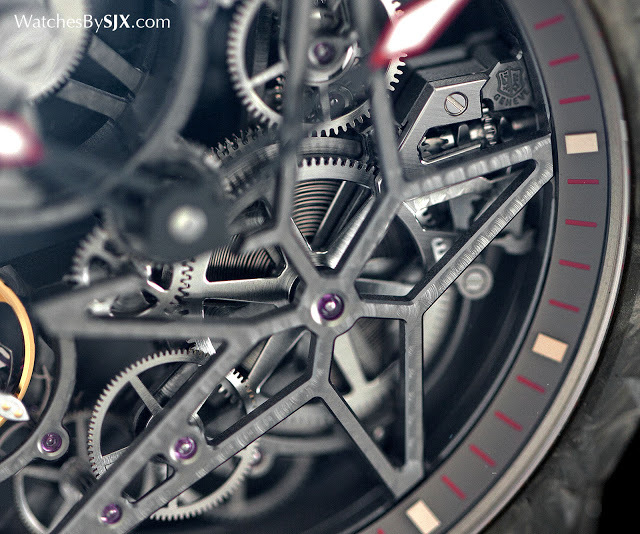 But before explaining the new Velvet watches, there was a single men’s wristwatch unveiled at SIHH, the Excalibur Automatic Skeleton Carbon. It’s a carbon composite case iteration of the entry-level skeleton wristwatch that made its debut last year. The carbon model is equipped with the same movement, an open-worked, self-winding calibre with a micro-rotor visible on the dial, as well as the main plate and bridges in the brand’s signature star shape. The case is 42 mm in diameter and made of carbon composite, a polymer with strands of carbon fibre mixed in for strength. That explains the marbled appearance of the material. This costs SFr59,000. Also with a carbon composite case is the Velvet Black, which also has a carbon composite dial, giving it a semi-sporty look. 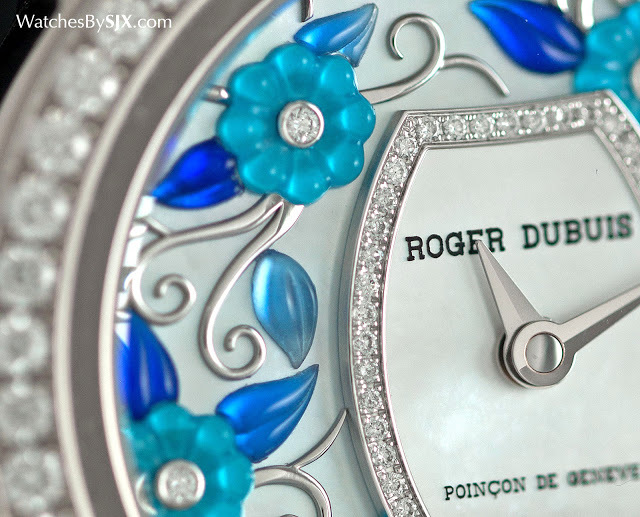 The bezel is set with green tourmalines from Paraiba in Brazil. 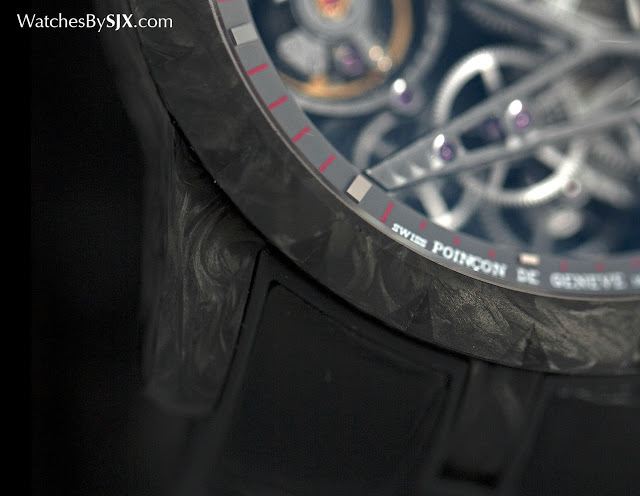 Unusually the stones are set on the carbon fibre bezel via patented process; it appears the bezel has channels filled with a white polymer that holds the stones. 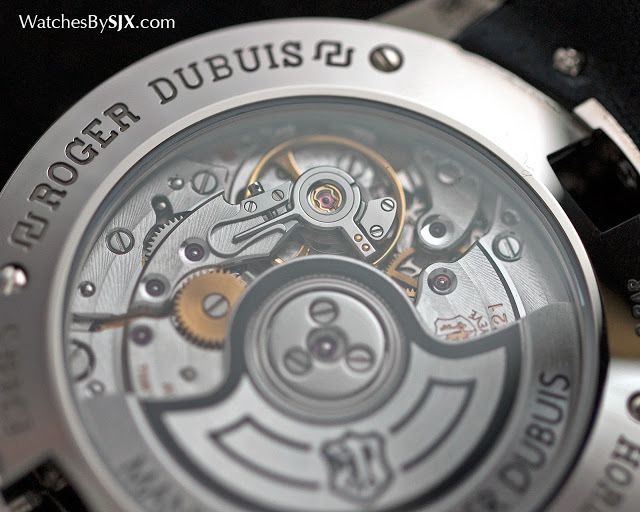 The case is 36 mm in diameter, with the RD821 automatic movement inside, the same calibre found the other Velvet watches. This is limited to 88 watches. Similar in shape and size is the Velvet Blossom that looks completely different. The Blossom is characterised by fired enamel flowers on the dial, each with a round diamond at the centre of the petals and stems in gold. 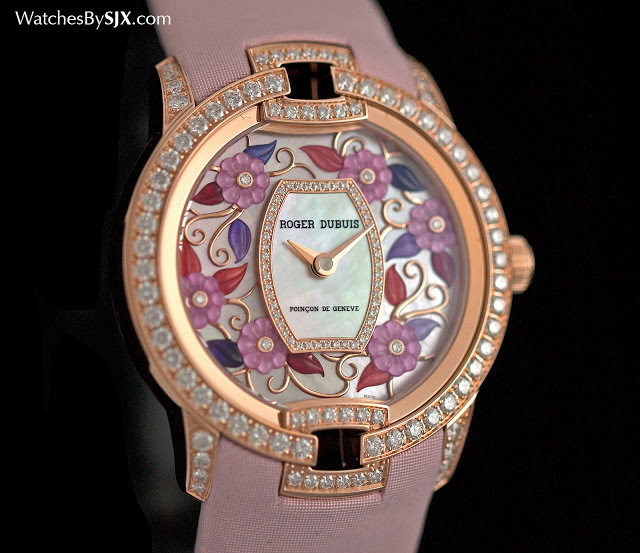 The Velvet Blossom is available with white or rose gold cases, with the dial base for the flowers either mother of pearl or enamel. 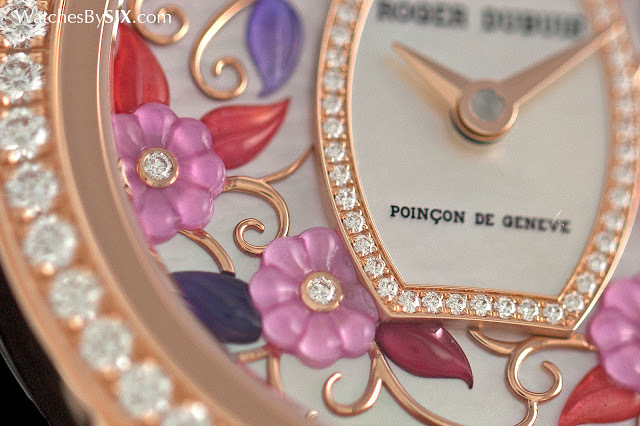 The mother of pearl dials are limited to 88 pieces, while the enamel dials are one-off creations. 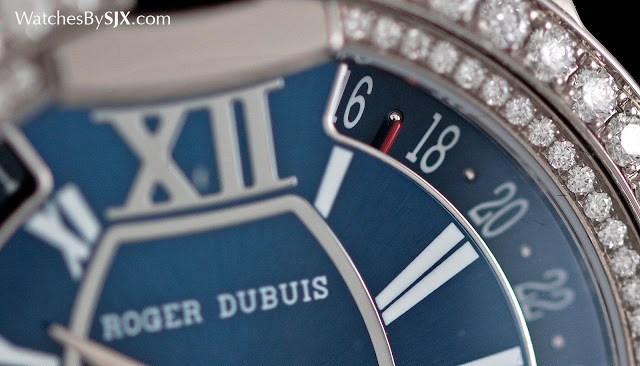 The 36 mm case is set with diamonds on the bezel and lugs. The Velvet Blossom starts at about SFr65,000. Roger Dubuis joined forces with Parisian shoemaker Massaro, best known for the footwear it makes for Chanel, for the Velvet by Massaro. 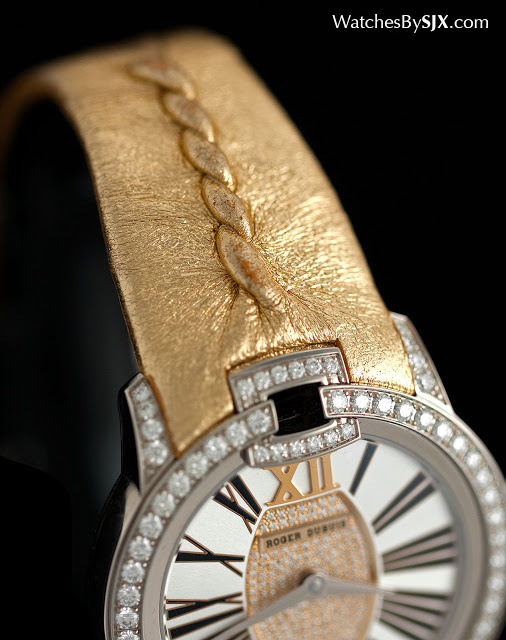 The first Massaro wristwatch is the Rita, named after actress Rita Hayworth. Massaro’s contribution to the wrist is the strap in gilded leather with pleats running down its middle, a feature taken from Massaro shoes. 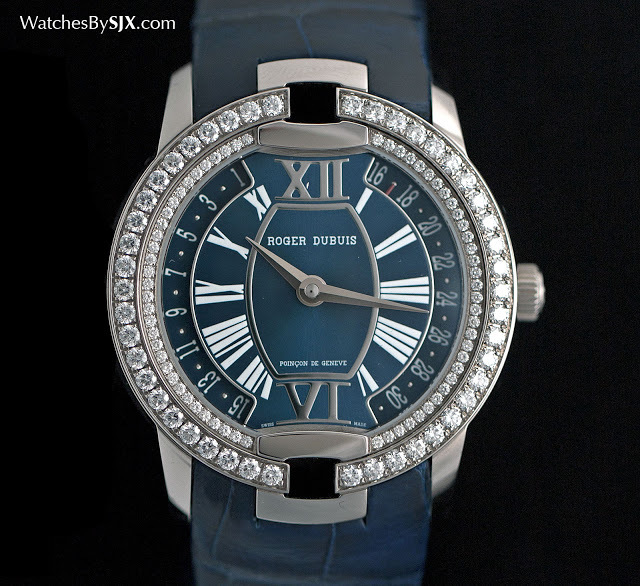 This is matched with a white gold case, set with diamond naturally, and a yellow dial. It is limited to 88 pieces. The sole Velvet watch with a complication is the Velvet Secret Heart. 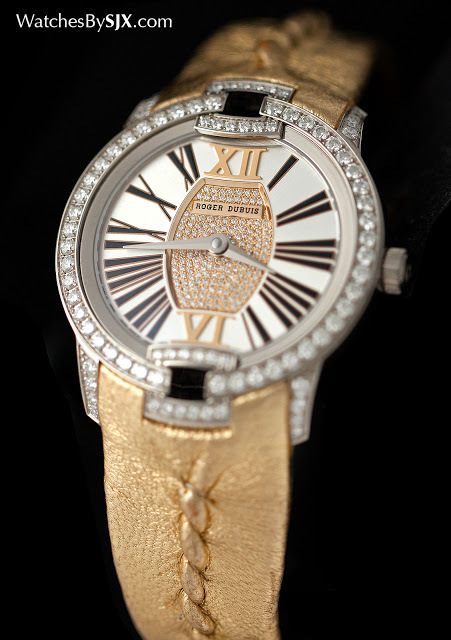 It features a double retrograde date display, a feature that was synonymous with the watches Roger Dubuis himself produced when the brand was founded in the 1990s. The bi-retrograde display occupies two semi-circular arcs on each side of the dial, with a tiny, red-tipped pointer indicating the date. Inside is the calibre RD821B, an automatic movement similar to that found in the other Velvet watches, but with an extra retrograde date mechanism. The Velvet Secret Heart is limited to eight watches. Stayed tuned for more personal perspectives on the other brands at SIHH 2016 to come over the following days. 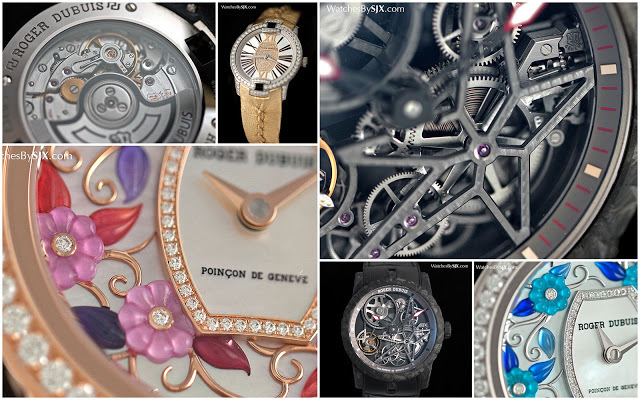 Links to the rest of our SIHH reports below. Baume & Mercier was all about chronographs at SIHH 2016, with a line-up that is made up of a new Shelby Cobra limited edition and the top of the line Clifton chronograph with triple calendar. Here's all you need to know, complete with original photography and prices. At SIHH 2016, Greubel Forsey made itself more accessible - relatively speaking - with the time-only Signature 1, presented alongside a variant of its double balance wheel timepiece. Here's all you need to know, complete with original photography and prices.